to provide assistance to those who want to undertake an assessment of how their agency performs its mission, to identify the advantages and disadvantages of the alternative means of performing the mission, and to develop a realistic vision of what can be achieved, as well as the necessary resources to accomplish the transition. 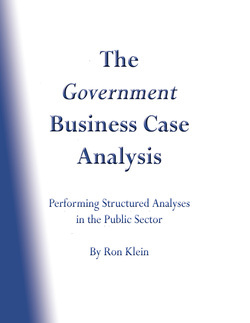 Intended Audience The intended audience for this book is government personnel who execute or review BCAs-especially those who have never been involved in the conduct of a BCA, have had only a peripheral role, or infrequently participate in the analysis and documentation of a BCA. In addition, this guide is written to be useful to senior managers who direct the BCA, as well as those who will be performing the research and analyses.